Spring cleaning… In FEBRUARY?! Tell that to a midwesterner and they’ll look at you funny, but here in America’s Finest City it belongs on the list of things we can do that the rest of the country can’t. As Winter is on its way out and Spring is in the air, one of the most widely adopted rituals is that of Spring Cleaning. It is a time to deep clean the home, purge things that no longer serve their purpose, and prepare for the active spring and summer months ahead. But where did Spring Cleaning come from? During the 19th century in America, prior to the invention of the vacuum cleaner, March was often the best time for dusting because it was getting warm enough to open windows and doors (but not warm enough for insects to be a problem), and the high winds could carry the dust out of the house. This time of year is also when coal furnaces wouldn't run and you could wash all the soot from the walls and furniture left by the furnace. For the same reason, modern rural households often use the month of March for cleaning projects involving the use of chemical products which generate fumes. 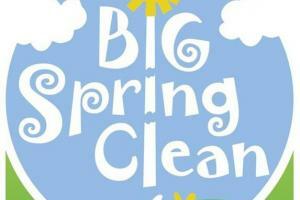 What are the benefits of Spring Cleaning? Do you ever feel stuck in a rut in your home? Unmotivated to socialize with anyone or instantly drained of energy when you pull in the driveway? Perhaps you attribute your efforts at work or your daily to do list for these feelings, but ask yourself: Shouldn't your home be a place to recharge your batteries? A place to rejuvenate and motivate you? Many times it is the stagnancy of clutter and state of each room in our home that puts up mental barriers which unconsciously makes us keep a distance between ourselves and other family members, friends, or house-mates. Going through the spring clean can give you the satisfaction and thrill of having achieved something. It gets the 'productivity' ball rolling and leads to more and more small victories. The process of cleaning itself is a great way of distressing and allowing yourself to remove focus from everything that may be taking over in that period of time. More importantly, the subconscious exercise that takes place when you clean helps release endorphins, therefore renewing your physical self by the end of the day. The mind tends to fall into a routine after a long period of time, and creating this change can truly reawaken you. Throwing away old boxes, giving away clothes that are no longer needed, finally fixing that wardrobe that broke three months ago—all of it takes part in your eventual liberation. You will also have much more confidence in inviting guests over and being the social creature we thrive in being. Take true stock over your possesions and keep in mind what you haven't used or touched in a year. All those things are taking up valuable space in your home - put it in storage! Moving furniture around could ensure that sunlight and air have much easier access inside your home. Stress and anxiety is much easier to release when you arrive home and there are no week-old dishes in the sink, or broken curtains that keep you from allowing the sun in, or so much dust over your white bookshelf that it looks grey. Coming back to a clear and tidy home encourages your mind to stay organized; charging you with energy. So what are you waiting for? The invigorating, stimulating spring clean is just around the corner, and Big Box Storage is here to help! Give us a call today to clear out clutter and make space for the most sucessfull you there is.